11-15 Scion tC Vertical Doors. Lambo Style Doors for Scion tC2. The ultimate show stopper! tC2 Vertical Door Kits by Vertical Doors are 100% Bolt-On. Stand out from the crowd with a Vertical Doors Kit (aka Lambo Style Doors) for Scion tC2. Scion Vertical Doors. Lambo Style Doors for Scion FRS, tC, xB, xD & More. 100% Bolt On Scion Vertical Doors will set off ANY Scion Vehicle. Vertical Doors, Inc is the King of Aftermarket Vertical Doors Kits for most Scion Models. 04-06 Scion xB Vertical Doors. Lambo Style Doors for Scion xB. The ultimate show stopper! xB Vertical Door Kits by Vertical Doors are 100% Bolt-On. 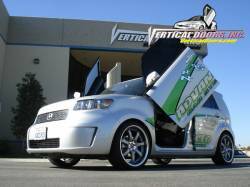 Stand out from the crowd with a Vertical Doors Kit (aka Lambo Style Doors) for your Scion xB. 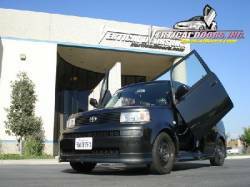 08+ Scion xB Vertical Doors. Lambo Style Vertical Doors for Scion xB2. 100% Bolt-On Vertical Doors by Vertical Doors, Inc. If you want to take home the trophy, Vertical Doors are the way to go. Scion xB2 Vertical Doors are shipping today! Description: Vertical Doors for the 11-16 Scion tC vertical-doors-2011-scion-tc. 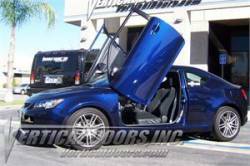 Finally Vertical Doors has released a Vertical Doors Kit for the 11-16 Scion tC (tC2). 100% Bolt-On with no welding or modifications required for install. Description: Vertical Door Kit for the 08-15 Scion xB (xB2) VerticalDoorsScionxB08. Set yourself apart from the crowd with a Vertical Door Kit from Vertical Doors for the 08-15 Scion xB. Vertical Door Kits come complete for hassle-free install! !